You are currently browsing the category archive for the ‘Double-kick’ category. I’ve mentioned in the past that I’m not a fan of double-kick playing. The primary reason: most double kick players are painfully oblivious to the lack of musicality in their drumming, because they are too focused on the physical challenges of proficient double-kick technique. In light of this, I have to give huge props to Travis Orbin, whose video audition for a grindcore metalcore band called Sky Eats Airplane includes not only incredible double-kick performances, but also a wonderful sensitivity to the music/art of the drumset. His kit incorporates a handful of unorthodox set-ups, and his playing is VERY tight/clean while also being super interesting. Notice that his left foot is often playing the kick while the right foot operates the alternate hihat, and then he seamlessly switches back to the “normal” kick/hat foot approach. He performed and/or recorded scores of albums (approximately 200) as a leader, co-leader or sideman with such renowned musicians and leaders such as Duke Ellington, Count Basie, Benny Goodman, Tommy Dorsey, Harry James, Woody Herman, Norman Granz’ J.A.T.P. (Jazz at the Philharmonic), Benny Carter, Sarah Vaughan, Ella Fitzgerald, Oscar Peterson, Art Tatum, Dizzy Gillespie, Gerry Mulligan, Stan Getz, Hank Jones, Zoot Sims, Sonny Stitt, Milt Jackson, Clark Terry, Louie Armstrong, Lionel Hampton, Eddie “Lockjaw” Davis, Shelly Manne, Billy Cobham, James Brown, Sammy Davis Jr., Tony Bennett, Pearl Bailey, Mel Tormé, Joe Williams, Wayne Newton and film composer John Williams. He is also credited with pioneering the use of two bass drums. To learn more about Bellson, check out his official website here, or his drummerworld.com page here. 1) My left foot is very busy on the hihat. For me to sacrifice the hihat stuff and instead use that limb on the kick drum, when my right foot is already committed to the kick, seems more costly than it is helpful. 2) The double pedal really only has one sound: lots of kick hits… really fast. Think about it. Most of us can play lots of kick hits at a slow or medium tempo, and many of us can play two (or maybe three) consecutive kick hits at a fast tempo. So… the only thing you can do with a double pedal that you can’t do with a single pedal is lots of kick hits at a fast tempo. That sound, while cool in the context of certain styles of music, is rarely appropriate outside of those styles – and those are styles that I rarely play. 3) Spending time practicing double pedal is not nearly as beneficial as spending time practicing other things (like rudiments, independence exercises, grooving with a click, or improvising). Once you have a double pedal, it’s hard to resist the urge to practice it a ton and build up your chops. I have seen many drummers who could shred on a double pedal but could barely do anything else. 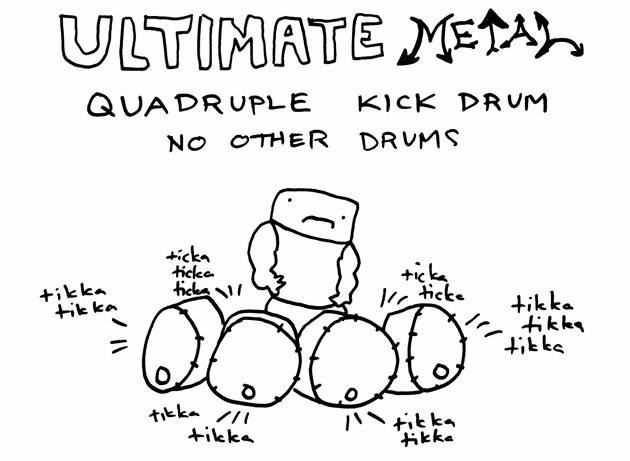 This is obviously problematic given that 99% of drumming, in any style, has nothing to do with double-kick chops. 4) The size and weight of my set-up is important to me. Seriously, I drag my drums all over town and load them in/out of venues/studios numerous times each week. I don’t want to bog down my hardware case with a piece of gear I don’t really need… and a double-pedal is not something that I really NEED. 5) I am constantly inspired by guys who rip it up with only a single pedal. For example, check out Lester Estelle or Mike Clemmons.